It seems that every now and then, Mother Nature unleashes an abundance of snow, rain -- or both -- over the Spearfish Canyon drainage area, and the consequences have sometimes been devastating. Prominent among the early floods was the May 1933 storm that produced a tornado, hailstorm, and a torrential rain that wiped out the Chicago, Burlington and Quincy tracks in Spearfish Canyon. In town, flooding reached as far north as the railroad depot on Canyon Street – in the general vicinity of the present day Spearfish Volunteer Fire Department building. Thirty-two years later, in 1965, Spearfish again felt the wrath of nature as about 30 inches of snow fell one weekend in early May. The following weekend, the rapidly melting snow was joined by another four inches of rain that hit the community hard. It resulted in yet another significant flood. The May 20, 1965 issue of the Queen City Mail noted that, “the flood of 1933 produced more water but not as much damage as this years’s edition. Water at that time (1933) reached as far east as Fifth Street Canyon Street was the end of the line for any great amount of damage this year.” Third Street and Canyon Street were hardest hit by the 1965 flood. Both the Grant Street and Nash Street bridges were destroyed. It was difficult for residents to make their way across the east-west corridor as a result. Few people around remember the flood of 1933, but there are lots of folks with vivid memories – spurred by lots of photographs – of the 1965 flood. One of those folks is John Sullivan, who was kind enough to share some of his flood pictures with us. You’ll find them in this 1965 Flood gallery. 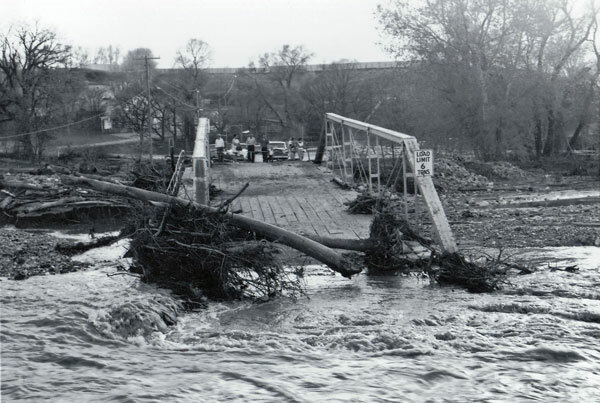 And Spearfish wasn't the only locale impacted by flooding in '65. Our friends at the U.S. Geodetic Survey offer this photo collection of flooding in the 1960's, including shots from Deadwood in May 1965. If you have poignant photos of this flood you'd like to share, we’d like to hear from you. You can contact us with a simple e-Mail. Thanks.